Wilpattu NP in Sri Lanka has the highest density of a leopard population, even slightly higher than in Yala. But due to the natural setting, chances to observe leopards are slightly lower than in Yala. However, Wilpattu is one of the 2 best places in the world to spot and observe leopards. Wilpattu, also spelt Vilpattu or Wilpaththu, is Sri Lanka’s largest national park, covering an area of more than 1000 square kilometres. This park is renowned for its leopard population, offering the highest density of leopards in the world, and so-called Villus characterizing the landscape. Villus are small freshwater lakes in depressions collecting surface run-off water. Wilpattu’s Villus are major feeding grounds for myriads of migrating water birds, for example several species of ducks. Particularly in the very centre and near the coastline of Wilpattu National Park lie sizable Villus, which are the most important destinations for Wilpattu safaris. Usually half-day safaris, starting at the main entrance in Nochchiyagama, will visit the centre of the park and only full-day safaris also reach the coastal area. 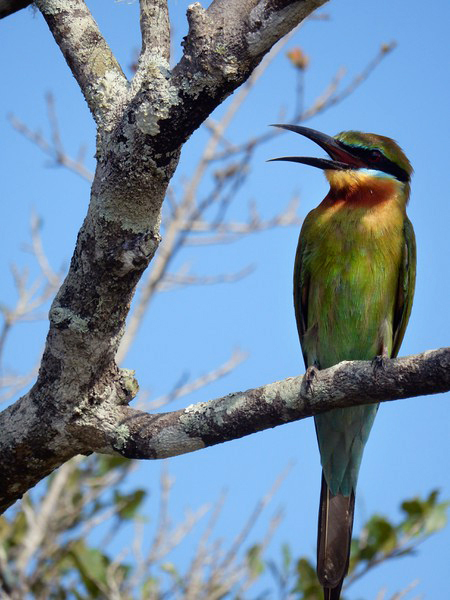 The best way to explore the beauty of this wildlife are camping safaris or overnight stays in park bungalows, of course. We can provide is a wildlife specialist organizing all kinds of Wilpattu safaris, particularly real safari excursions with accommodation inside the national park. Alternatively, we offer accommodation at Tabbowe lake just outside the park border, for budget travellers who like to avoid the high wildlife department charges for overnight stays inside Sri Lanka’s national parks. including deer, elephants, wild boar, sloth bears and, as already mentioned, numerous leopards. The biodiversity of the park, ranging from bantam creatures to colossal elephants, enhances the ecological significance of this forest. Wilpattu national park is of importance from an archaeological perspective, too. The first ports of the island were located in this area and Pomparippu is an important pre-sinhalese excavation site. Wilpattu’s coastline is also the place where the very first Sinhalese settlers are believed to have arrived in Sri Lanka. Wilpattu National Park (WNP) is situated along the Northwest coast of Sri Lanka. The distance from Colombo is 150 km, as the crow flies, and about 180 km by road. It is a 4 or 5 hours drive from Colombo. The main entrance and park office is at Hunuwilgama, which is not far from Thimbiriwea and Nochchiyagama at the A12 main road, halfway between Puttalam and Anuradhapura. The turn off to the Wilpattu National Park is near the 45 km post of the A12. From here, follow the B028 norrthwards for about 8 kilometers. The south-western edge of Wilpattu is located 25 km north of Puttalam. The Hunuwilgama park entrance is in 45 km distance from Puttalam and 30 km west of Anuradhapura. 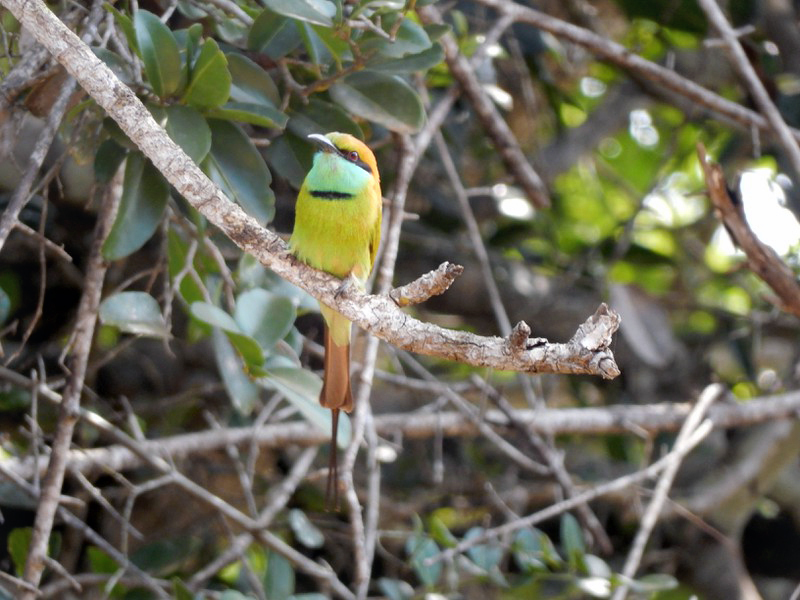 Wilpattu National Park, extending from the northwest coast inland towards Thanthirimale, measures 40 km from east to west and almost 50 km from north to south, covering about 132,00 hectares. The length of the park’s coastline is 35 km. The area of Wilpattu National Park spans the border between the North Central Province and North Western Province. The northern edge of the park is at the border to Sri Lanka’s Northern Province. Wilpattu is bordered be the rivers Kala Oya in the south, Kal Aru in the north and Ariwi Aru in the north-west and it is crossed by the river Modaragam Aru. The altitude of the highest point or Wilpattu is 152 metres above sea level. The western part of the Wilpattu National park is crossed by public streets, which run parallel to the coastline. In January 24, 2010, the A32 highway connecting Puttalam with Mannar, was reopened after 22 years. The average temperature in Wilpattu National Park is around 27 degree Celsius. Annual precipitation is about 1000mm. Though part of the Sri Lanka’s dry zone, the climate inside Wilpattu Park is unlike that of other dry zone regions, less arid, because inter monsoon rains come to Wilpattu in March and April additionally. The main rainy season in Wilpattu is between October and January, which is the period of the anti-monsoon. The period of drought extends to early September. Before 1985, the park was closed in August every year, during the dryest period. 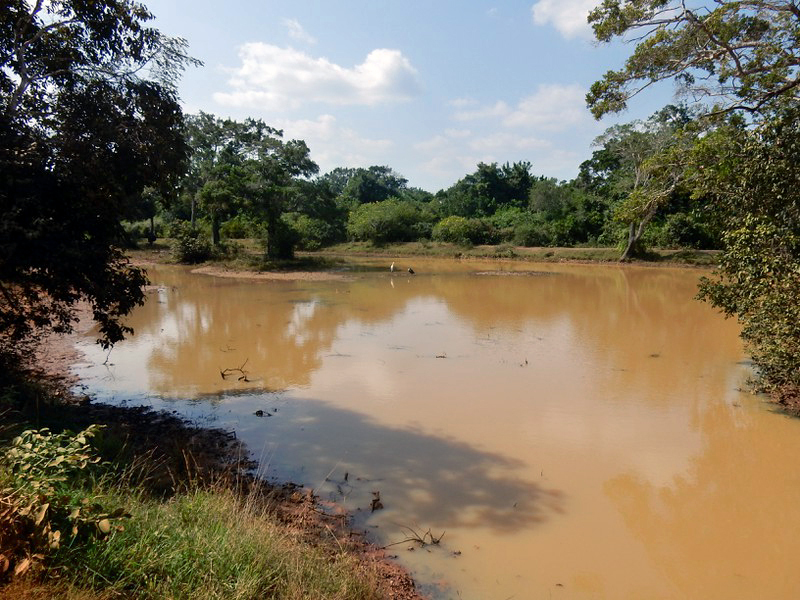 A unique topographical feature of Wilpattu National Park is the plentitude of natural sand-rimmed water basins, which are depressions filled with rainwater set within dense scrub jungle. These waterholes are surrounded by ringss of delicate white sands and open grassy plains. They are called Villus and are the namegiving entitities of the park, since “Wil-pattu” means “Villu-area” or “Lake-land”. Villus are usually flat and contain purely fresh water. Except for two, all the others contain rainwater. There are 40 villus within the park of which 27 are large. The largest Villu is Kokkariya. Pannikar Villu is named after traditional elephant catchers, who were mostly Muslims in this region. Altogether, there are about 60 lakes and tanks in Wilpattu. Most of them are grouped in the very centre of the park or scattered along the coastline in the west. The abundance of waterholes is the reason why wild animals are attracted to the park area particularly during the dry season. 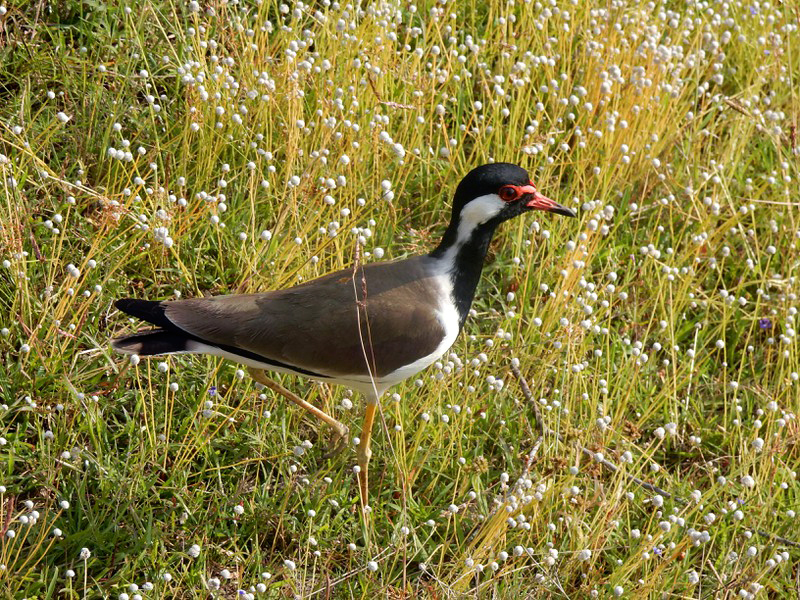 During the winter season, the Wilpattu’s Villus are important for migratory water-birds. The jungle surrounding the Villus is typical dry zonal but fairly thick and dense compared to other regions in the north and east of the island, where the forests are dryer scrublands. Particularly the western sector of Wilpattu further inland is covered with deep forests. Many sandy paths wind around the entire national park and open up into those large Villus. The open grasslands sourrounding the Villus and some sandy clearings offer best opportunities to observe wild animals. A striking topographical feature confined only to certain sectors of Wilpattu National Park is copper red soil. It contains high levels of iron and other minerals, that give it a unique reddish tone. This colourful soil became namegiving for the entire island, Sri Lanka’s ancient designations “Tambapanni” or “Taprobane, meaning “red soil” or “coppery sands”, refer to this characteristic colour of the soil at the landing place of the first Sinhalese settlers, which was this coastline of Wilpattu. Wilpattu NP can easily be reached from my guest house in Mihintale. As already mentioned, Wilpattu’s forest ist dense and less scrubby and water is more abundant than in other dryzone areas. There are different types of vegetation in the park, namely littoral vegetation including salt grass and low scrub, found adjacent to the beaches, secondly a 5 to 10 km wide coastal belt of monsoon scrubs of low stature; and, further inland, mainly monsoon forest with typical tall emergents. Examples are fruit-bearing trees such as Palu (Manilkara hexandra) and Weera (Drypetes sepiaria), others are typical evergeen forest shrubs such as Milla (Vitex altissima) and Wewarna (Alseodaphne semecapriflolia), some are precious timber such as Satin (Chloroxylon swietenia) and Ebony (Disopyros ebenum). Doubtlessly, the biggest draws for safari enthusiasts visiting Wilpattu are Leopards and Sloth bears. Alongside these two wildlife highlights, it is likely to sight Asian elephants, buffaloes and boars. 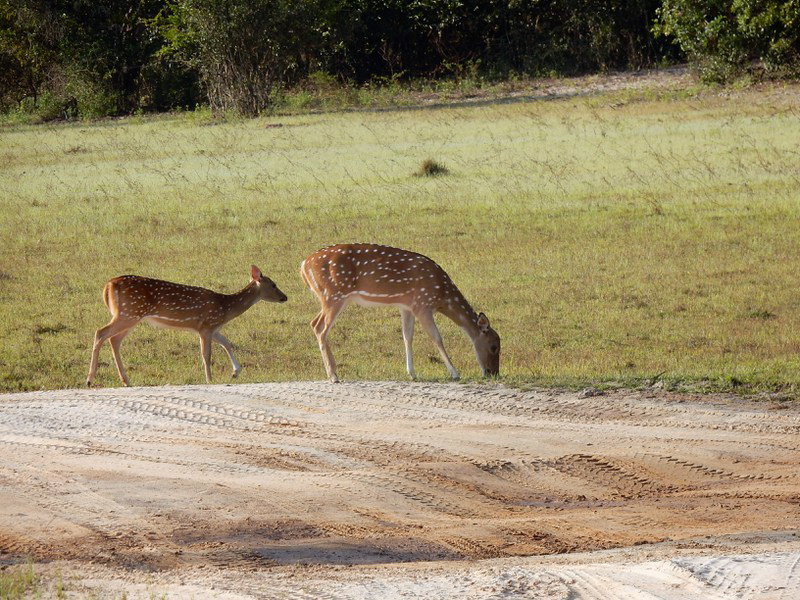 Spotted deer is common all over the island’s dryzone, whereas Muntjacs, also known as Barking deer and Mastreani deer, are more easily seen in Wilpattu than any other national park in Sri Lanka. Sambhar also occours. A typical dryzone mammal of medium size is the mongoose. 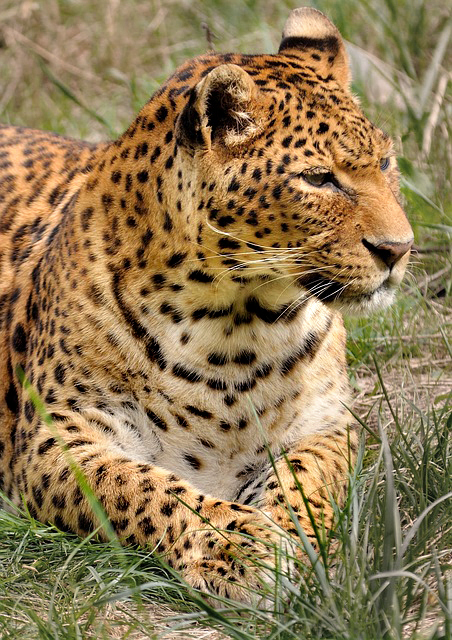 The Sri Lankan leopard subspecies (Panthera pardus kotiya) is larger than leopards in India and Southeast Asia. Yala is famous as one of the world’s best places to observe leopards in the world, but probably there are even more leopards living in Wilpattu, making this national parh the area of highest leopard density in the entire world. These beautiful big cats can often be spotted lounging beside the villus inside the park. The exact Leopard population numbers in Wilpattu are still not yet known. The Sloth bear population isolated in Sri Lanka is considered a separate subspecies. The Sri Lankan Sloth Bear (Melursus ursinus inornatus) is an omnivorous species that relies heavily on forests for survival. So not surprisingly, the decline of forests in Sri Lanka has indeed impacted the sloth bear population, resulting in the species being noted as highly threatened. Approximately less than 1000 Sri Lankan Sloth Bears are living in the wild today. Sloth Bears are best seen during the fruiting season of the Palu Tree, which is from June to August during the dryest period of the year. Asian elephants (Elephas maximus) are seen most often near Mail Villu. Elephant groups migrate near the coastline in the north-western part of the park area, which is threatened by new road constructions. 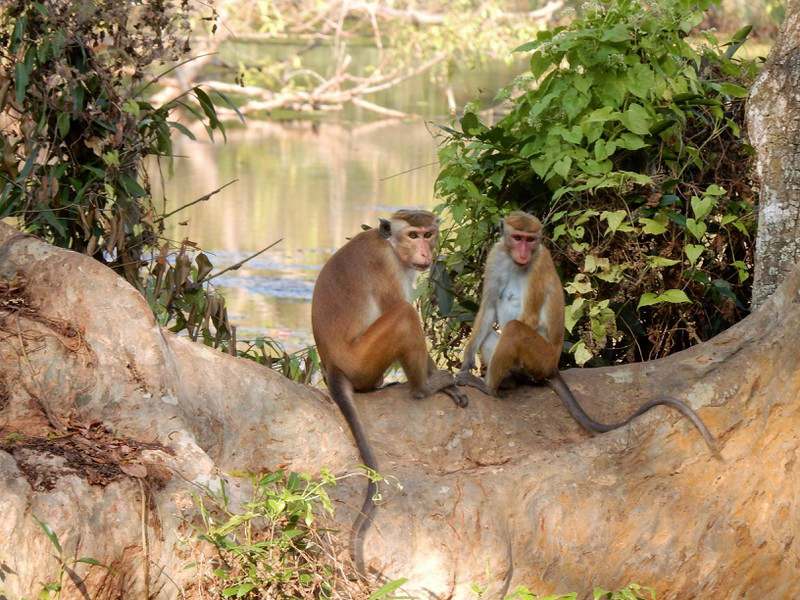 Mammalian ecological density could be the highest in Wilpattu, though mammal biodiversity is higher in Yala. 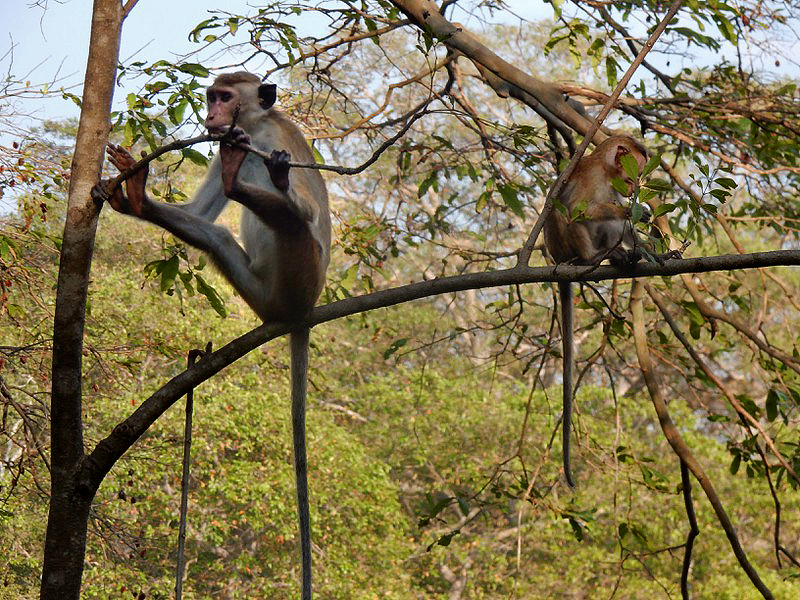 A total of 31 species of mammals have been recorded inWilpattu, compared to 44 in Yala, but additional species, particularly Rodentia and Chiropotera, are unbodoubtedly present in the Wilpattu National Park. Some of the mammal species identified are threatened with extinction. 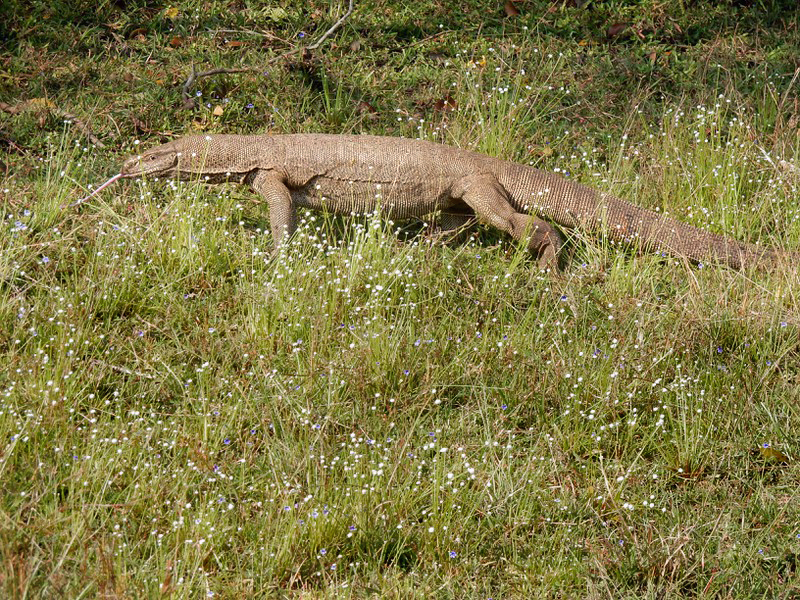 Common reptiles found in the park are Mugger crocodile (Crocodylus palustris), Bengal Monitor (Varanus bengalensis), Common cobra (Naja naja), Rat snake (Ptyas mucosus) and Indian python (Python molurus). 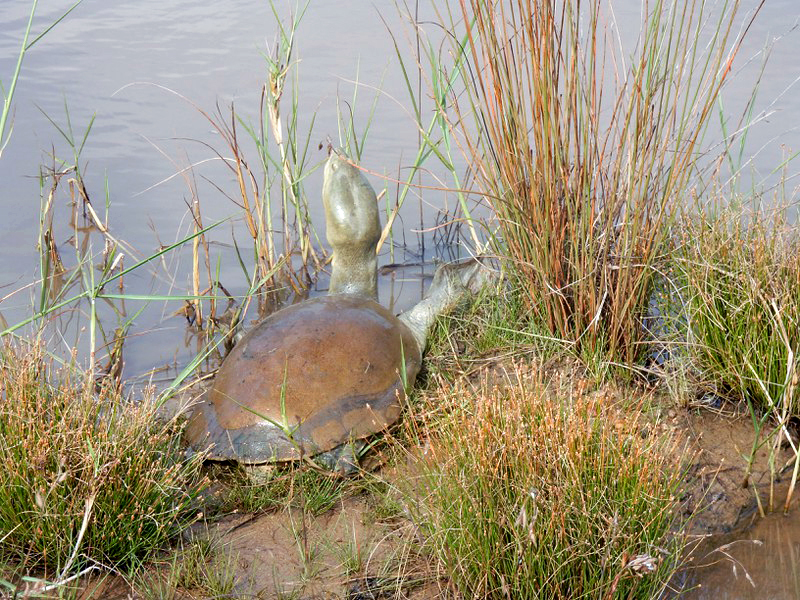 The Pond Turtle (Melanonchelys trijuga) and the Soft shelled Turtle (Lissemys punctata) are resident in Wilpattu’s large permanent Villus. The Star tortiose (geochelone elegans) lives on the grasslands surrounding the Villus. Termites of the Genus Trinervitermes probably account for the most significant portion of Wilpattu’s invertebrate bio mass. They also live in the scrub forests of the park. Water birds are found due to the Villus, of course. 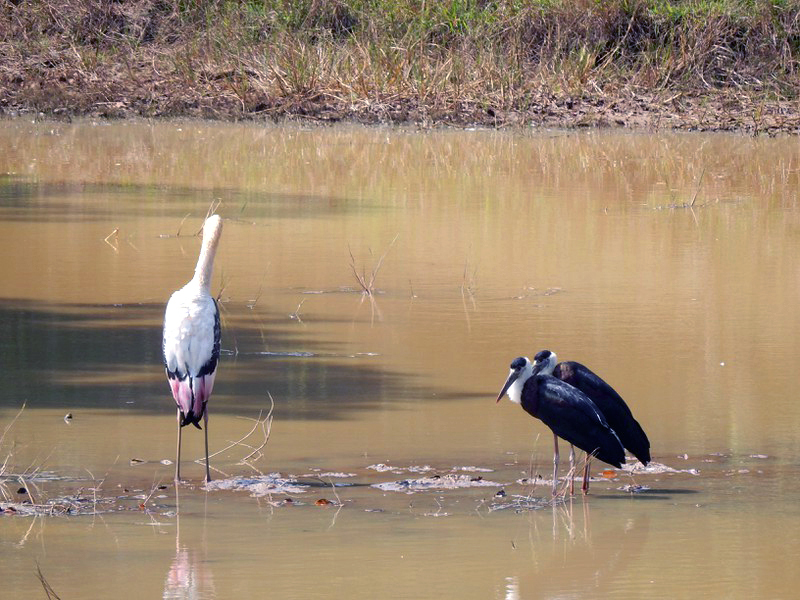 Wetland bird species in Wilpattu National park are Painted stork (Mycteria leucocephala), Asian Openbill (Anastomus oscitans), Little cormorant (Microcarbo niger), Garganey (Anas querquedula), Pin tail (Anas acuta), Whistling teal (Dendrocygna javanica), Spoonbill (Platalea leucorodia), White ibis (Threskiornis malanocephalus), Purple heron (Ardea purpurea), Large white egret (Egretta alba modesta) and Cattle egret (Bubulcus ibis). 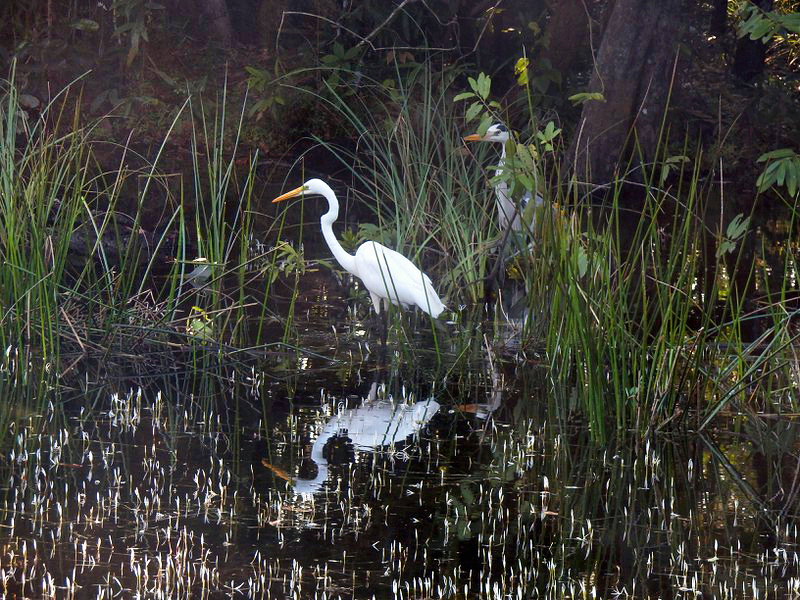 Many species of owls, terns, gulls, buzzards, kites and eagles are to be found at Wilpattu National Park. Endemic birds occuring in the Wilpattu Park include the Sri Lankan Junglefowl (Gallus lafayettii), Brown-capped Babbler (Pellorneum fuscocapillus), Sri Lanka Woodshrike (Tephrodornis affinis) and Black-capped Bulbul (Pycnonotus melanicterus), particularly in riverine habitats. Butterflie species recorded in Wilpattu Park include the Great Eggfly, Great Orange Tip, Glad-eye Bushbrown, Blue Mormon, Common Mormon, Common Rose and Crimson Rose. Wilpattu is an area steeped in history and covered with legend. The most important one associates it with the arrival of the Sinhalese from western India. They landed as followers of their leaderVijaya at Kudrimalai Point, also spelt Kudirimalai or Kudirumalai or Kudiramalai and called “Horse Point”. This red-sanded protrusion into the Gulf of Mannar, rising about 15 metres above the sea, is located in the north-western edge of the park. Vijaya is said to have maried a local female “demon” dalled Kuveni, who is said to have lived at Kalli Villu. The “Kuveni Maligawa’ is an ancient site amidst the jungle, it consists of an ensemble of stone pillars. The geological origins of Kudrimalai are shrouded in mystery, there is a popular belief that this site was created by an meteor strike. The reason behind this assumption are the burnt rocks in this area. By the way, Kudrimalai is a Tamil word and literally translates as “Horse Mountain”. It is believed that the name derives from the historical fact that horses were traded by Muslim seafarer in return for pearls from the flourishing pearl banks in the Mannar region slightly northwards. Mannar was famous for pearl industry and pearl trade already in antiquity. However, it was during the Middle Ages, that Arab and Persian traders started to export horses, they do not like to breed in the humid Indian climate but were imported for military purposes by South Asian rulers. However, one legend has it, that a Queen Alliserrani, also spelt “Alli Rani”, who once ruled over the Wilpattu region, was a great lover of pearls and exported pearls bounds for the treasure chests of Middleeast rulers, in exchange for their highly valued Arabian horses. Queen Alliserrani was a kind of Sri Lankan Otrere or Hippolyte, a queen of an Amazon army. Alliserani hated men and therefore had an army of all-woman warriors. Her palace allegedly lies beneath the Kudrimalai cliff. Others believe that there are ruins here of what was once a huge statue of a horse, namegiving for this strange place. Another legend holds, that the most famous love story of Sri Lanka partly took place in the Wilpattu area. Prince Saliya, son of national hero King Dutugemunu, is said to have lived in Wilpattu after being banished by his father because the prince fell in love with the lower caste girl Ashokamala. They are believed to have lived hidden in Maradanmaduwa in Wilpattu. One of Sri Lanka’s most signifcant prehistoric sites is located within the precinct of Wilpattu National park. Pomparippu is the founding place of urns containing the remains of early pre-Sinhalese settlers. The dating of the urns is not easy, presumably they are from the middle of the first millennium BC. An iron blade was found in the burial ground of Pomparippu, indicating the beginning of the iron age in Sri Lanka immediately after the stone age. This means, there was no bronze age period on the island. This can be best explained by assuming that the iron was imported from the mainland. Furthermore, there are remains of an ancient harbour between the villages of Palangaturai and Kollankanatte. It was this area of Wilpattu or Mannar that was most probably visited by Roman subjects in the period of Emperor Claudius in 47 AD. Pliny the Elder already mentions “Taprobane” in his writings. He reports, a vessel of a Roman tax collector was blown off course by the monsoon and landed in “Hippuros”, which means “Horse Mountain”, which translate to “Kudrimalai” in Tamil, as already mentioned. The local king later sent his own envoys to Rome. Indeed, the Mannar and Wilpattu area had the island’s most important harbours close to the ancient capital Anuradhapura. Beyonf doubt, there have been trade relations with the Roman Empire. And it’s very likely, these west coast ports played the major role in it. Near Kudrimalai Point, there is a structure where a Muslim saint is believed to be buried. Wilpattu is among the oldest protected wildlife areas in Sri Lanka. 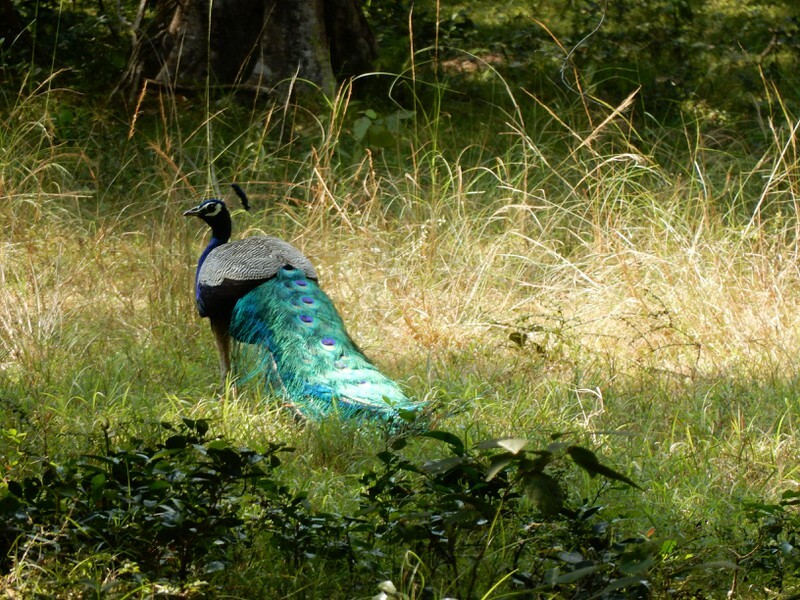 Being a game preserve of the British, Wilpattu was decared a sanctuary in 1905. It was officially upgraded to national park status on the 25th of February 1938. The Wilpattu National Park was made under five declarations, after 1938 also in 1968 and two times in 1969 and finally in 1973. In the 1970s, Wilpattu was Sri Lanka’s most popular wildlife park, because it’s closer to Colombo and more easily to reach than Yala. However, things changed in the 1980s. Because of attacks of guerilla fighters, who also killed rangers during the civil war, Wilpattu National Park was closed for visitors most of the time till 2010. On the 5th of May in 1985, the Wilpattu Village had been the target of a raid of an armed group of LTTE fighter, who masscred 18 villagers, including women and children. This was the reason for closing Wilpattu National Park for the first time. From December 1988 to March 16, 2003, the park was officially closed due to security concerns. Before the 2002 cease fire agreement, rebels used the park as a hiding place. On the 27th of May 2006, the award-winning author Nihal de Silva and seven Sri Lankan tourists were killed by a land mine in Wilpattu, supposedly planted by the LTTE, maybe even after the cease fire agreement. On the 9th of March 2007, eight people who entered the Wilpattu National Park to investigate the local human-elephant conflict, were ambushed and killed by LTTE militants. The Sri Lanka Army Area Commander, the head Park Warden and three park rangers were among the victims. After the total defeat of the LTTE in 2009, Wilpattu National Park was finally reopened in March 2010. Now it has become a popular wildlife destination again, though still less famous than Yala National Park - and less crowded with jeeps. In January 24, 2010, the A32 highway connecting Puttalam with Mannar, was reopened after 22 years. A road connecting Puttalam and Mannar has crossed the Park area already before the civil war. The same route was already used as a car track 350 years ago. But there is an ongoing dispute about the latest expansion and additional new roads. After the reopening of Wilpattu in 2010, also parallel roads and further side roads were constructed, particularly in the north-western part of the park, which is of utmost importance for migrating elephants. This is why environmentalists complain about the ongoing road development scheme inside the national park boundaries, claiming that it is a serious disruption of the wildlife area and maybe even illegal, as contruction works violate Sections 3 and 6 and using roads for transport violetas Section 5 of the the Fauna and Flora Protection Ordinance. Fragmenting the ranges of elephants jeopardising the leopard population by segregation of their territories are the regrettable main perturbations. The new roads also resulted in numerous road kills of various animals such as deer and buffaloes. Further problems for the ecosystems of Wilpattu and in other wildlife areas are poaching and illicit felling of timber. In the vicinity of Wilpattu National Park, there are two tourist hubs with a variety of accommodations, namely Anuradhapura in the Cultural Triangle and Puttalam and Kalpitiya Island at the western coast. Both destinations, attarcting heritage tourists and water sports enthusiasts respectively, are perfect starting points for half-day safaris to the group of Villus in the core of the park. However, for full-day safaris and for starting in the early morning it is highly recommendable to have overnight stays closer to the park entrance. For example, near the turn off to Wilpattu at the Puttalam to Anuradhapura road A12 is the a simple accomadation called Hotel Leopard Denn Inn, formerly known as Preshamel Safari Hotel. Wilpattu Safari Lodge is situated in close proximity to Wilpattu National Park entrance in a large compound surrounded by lush greenery. Another location closer to the park entreance gate and even a wildlife attraction in itself is at the Tabbowe lake. The best way to explore this great national park, of course, is to take part in a several-days safari. For this purpose, bungalows and movable tented safari camps are available inside Wilpattu National Park upon request. A very attractive wooden upstairs park bungalow using satinwood and kumbuk timber is Kokmote. My own guest house in Mihintale is also a good starting point for Wilpattu safaris, particularly afternoon or evening safaris. However, the main gate is in only 1 hour driving distance in the morning, morning safaris can be reached, too, in case you accept departure at 5.00 am. 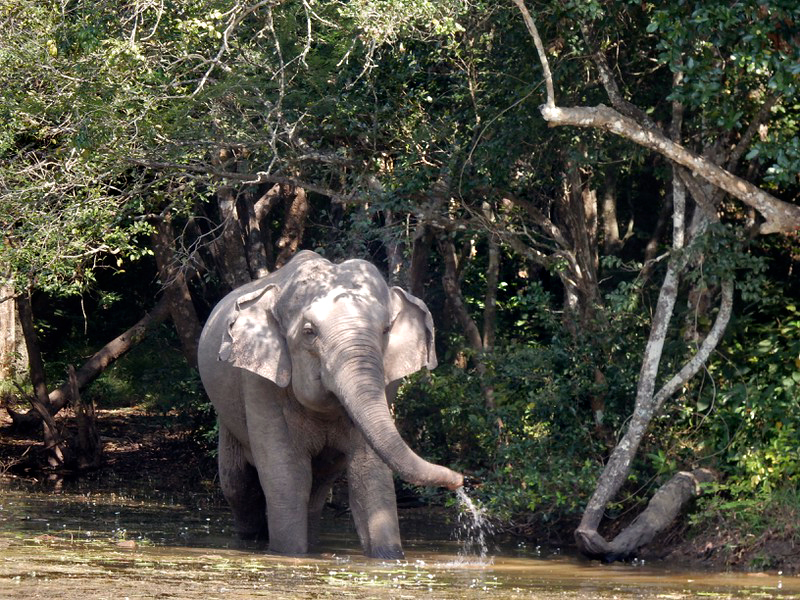 Wilpattu National Park is ideal for those wanting to avoid the tourist crowds and escape the flurry of Yala. Instead of this, Wilpattu offers the opportunity for a more peaceful and undisturbed drive. Though this national park can be visited throughout the year, the months of October and February at the beginning and at the end of the local rainy season are highly recommended. The best sloth bear observation time is Palu fruit season in July. Visitors can only tour some 25% of Wilpattu, because 75% of this national park is dense forest or scrub. Due to the fewer number of visitors, the wildlife within the confines of the Wilpattu National Park has hardly had contact with humans until now. This means, the animals are often shy, compared to those in Yala National Park. Though Yala got a reputation as the best spot to observe wild leopards, Wilpattu will not disappoint you in this respect, though indeed, on normal half-day tourist safaris, chances are slightly higher to sight these beautiful big cats in Yala, sinceYala has many more rock boulders, where leopards like to rest during daytime and can easily be spotted. Nevertheless, there are even more leopards in Wilpattu, and leopard-watchers taking part in several-day real safaris may even prefer Wilpattu National Park, particularly when led by experienced wildlife specialists like Kapila. For those, who take their time for this purpose, Wilpattu provides numerous opportunities to film or photograph these magnificent animals, which are often seen lying beside the Park’s many villus or roaming on the sandy pathes. For those interested is several-day real safaris, tented safari camps are set up inside the park, as already mentioned. Overnight stays inside the park boundaries enable you to go on walking trails and night safaris around the campsite - but not alone. All photos in this column are kindly provided by my guest and friend Leo Moelker from Rotterdam in the Netherlands, who is the copyright holder. I am very thankful and appreciate his support very much.